- George Durzi, MedMen, VP of Engineering. George is an experienced software engineering leader with a demonstrated history of shipping products andbuilding high-performing teams. Strong engineering professional skilled in full-stack softwaredevelopment and modern cloud architecture. - Jim Baudino, MERRY JANE Media, VP of Corporate Relations. MERRY JANE Media is the global cannabis media platform and creative agency co-founded by Snoop Dogg in 2015. Jim has been instrumental in building the MERRY JANE brand since its launch, and he has made it his mission to educate the mainstream about the benefits of cannabis. Jim recently helped launch the agency side, and he is currently responsible for all communications and strategic partnerships for the brand, including event strategy and integration. - Courtney Aura Freeman, White Buffalo, CEO is a cannabis industry business consultant and entrepreneur. Referencing a background in marketing technology, she advises businesses on compliant packaging, product development, licensing and marketing solutions. Ms. Freeman is a regular contributor to media publications and conducts educational speaking engagements viewable at CannaProductConsulting.com.A legacy lifestyle brand in the cannabis space, White Buffalo is known for the forty-year- old rolling papers, proprietary PEACE CBD Massage Primer, and bespoke merchandise for the cannabis enthusiast available at WhiteBuffaloSpirit.org.Courtney supports cannabis-centric community building by producing B2B and B2C events listed at WhiteBuffaloCannabis.com/events. - Roger Obando, Baker, Co-Founder. Baker is the leading CRM for the cannabis industry, servicing more than 1200 dispensaries across the US and Canada. Baker helps dispensaries generate more revenue and build relationships with their customers through a variety of products featuring online ordering, customer loyalty, messaging, and analytics. Founded in 2014, the company graduated from notable startup accelerator 500 Startups and was already one of the most funded companies in the cannabis space with $11.5 million in total capital raised before merging with several other cannabis companies and going public on the Canadian Securities Exchange as TILT Holdings. Since going public TILT has made several other acquisitions and is positioned as one of the largest cannabis infrastructure and logistics providers in the world. Roger has recently exited his position at Baker and is now an advisor, consultant, investor and advocate in the cannabis community. - Brian Weiss, L.A. Cannabis News, Founder. Brian has always been an advocate for cannabis and has had a strong connection in the cannabis industry for over 20 years. 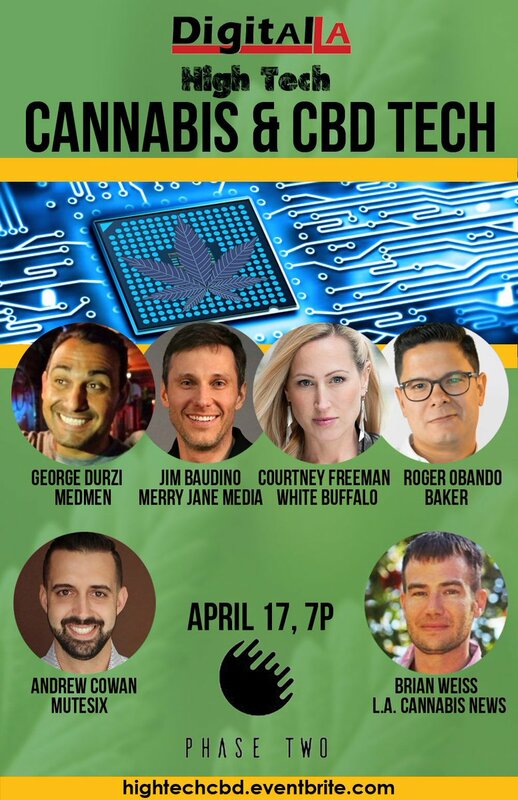 Brian grew up in an entertainment family and has been focused on marketing & business development within the cannabis, entertainment and digital media sectors. He began his career in entertainment with his first job at KROQ in the late 1990’s and then advanced to working with many of the biggest entertainment and tech companies in the world. - Andrew Cowan, MuteSix, VP Paid Media. Andrew manages multi-million dollars in ad spend across multiple platforms, focusing on Facebook and Instagram advertising, but also creating campaigns across Pinterest, Snapchat, Twitter, and more. He works with Mike Tyson's company, Tyson Ranch, on their CopperGel line of products. Andrew also works with other companies in the CBD skincare and pain relief industry. PARKING - Complimentary parking in the PhaseTwo lot. SPONSORS: Sponsor this event with a sponsor table! We provide a table, you can bring your tablecloth, signage, products, etc. Select the sponsor ticket above, and then email info@digitalla.net with HIGHTECH as subject and your setup needs, and we will intro you to the event logistics perosn.